My name is Greg Swaine (aka @Can_solo_gaming on Instagram and as myself on the Solo Board Gamers group on Facebook). I am a Developmental Services Worker and Mental Health Advocate from Aylmer, Quebec Canada. I am happily married to the love of my life, Jennifer and we have two little girls, Lily and Grace who are ages 3 and 1. Due to my shift work from my job and my two little girls taking up most of my time, I have dedicated my time to our hobby to predominantly solitaire friendly boardgames. My wife is not a board gamer in the slightest, but she 100% supports my passion and dedication to them! So because of all of these factors I became “Can_solo_gaming”. It was in December of 2015 that I decided to try out board games for the first time. 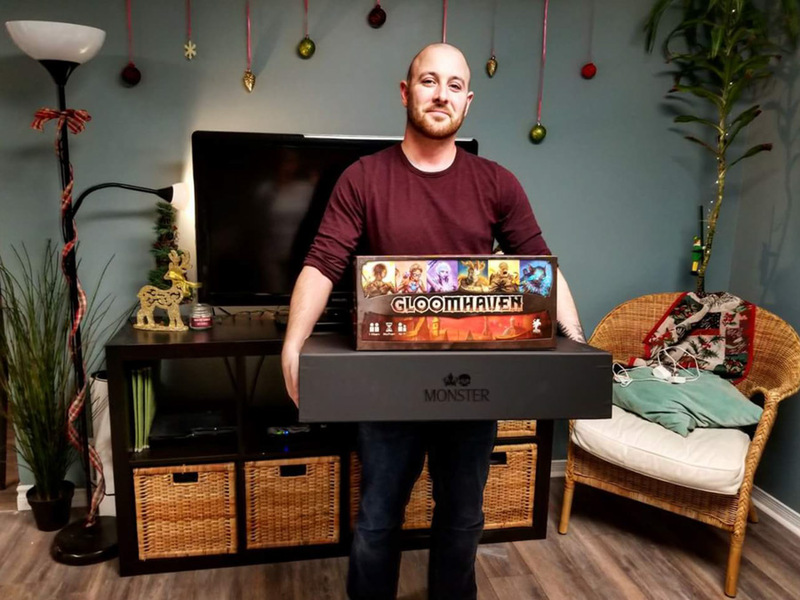 I had no friends at the time who were interested in board games (or so I thought, and found out my friend Erik was into games later on thanks to my board game account!) and I was sitting on the couch with my wife browsing Netflix for another TV show to binge…I had zero interest in watching TV anymore and wanted something new that would actually keep my mind busy. 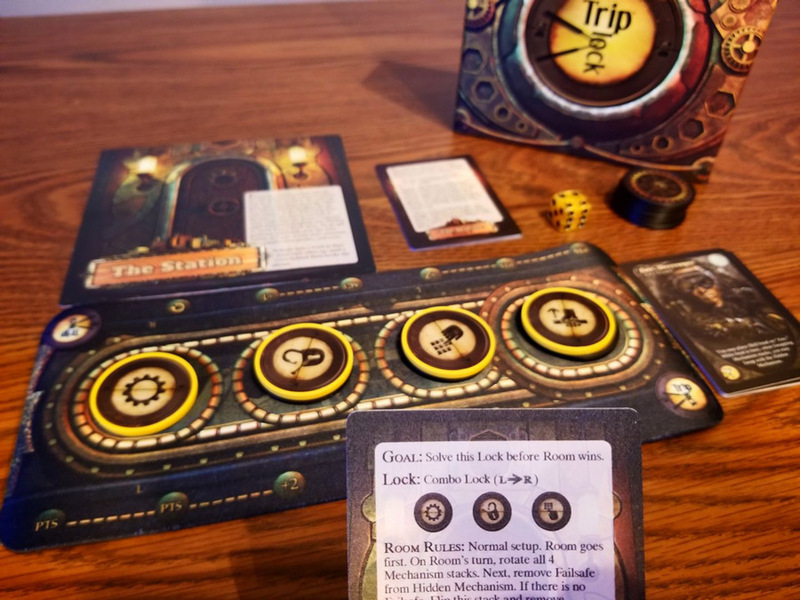 I’ve always loved fantasy and horror and wondered if maybe there was such a thing as a 1 player board game? Video games were out of the question because my wife wanted to keep watching Netflix and at the time we only had a PS3 which was the device we used to access our Netflix account. A quick Google search later and I found the 1-player Guild on BGG (BoardGameGeek.com) and their Top 100 solo games of 2015 poll. I purchased my first ever board game shortly after. That game was Pathfinder Adventure Card Game, which has since left my collection as I found more and more games that better suited what I was hoping to get out of playing solitaire board games. 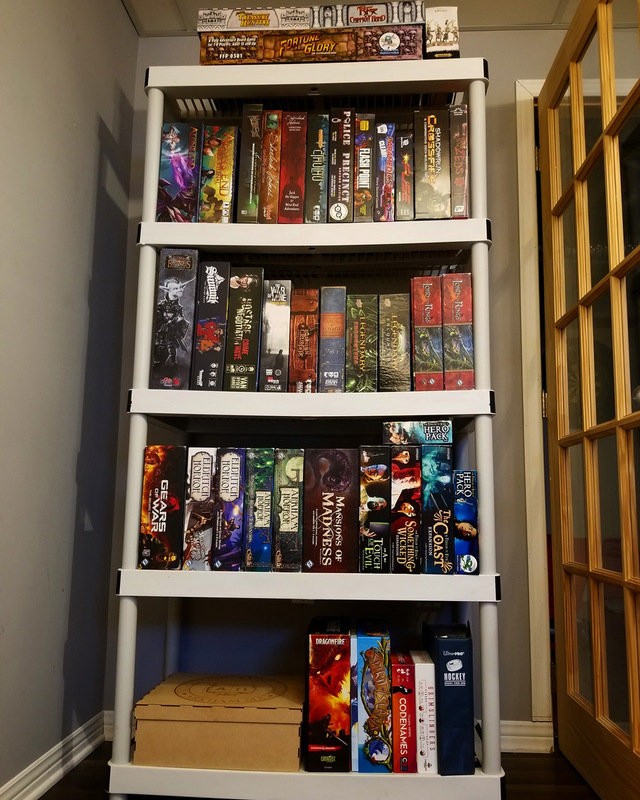 I’ve since added an amazing collection which I am very proud of and feature frequently on all my Board Gaming accounts. As of today my collection consists of 130 Boardgames and expansions! As often as I can! My job has me working alternative shift work so 2 weeks out of the month I often don’t get home from work until 00:30! During the day I spent as much time as I can with my family. 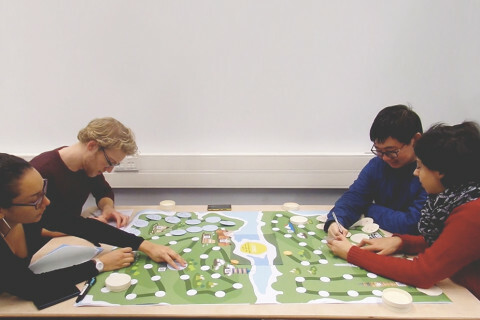 But during quiet time or when I am working my day shifts I play board games whenever I can find the time. My 21×10 Challenge for 2018 (21 board games with at least 10 plays each) has already seen me have 15 plays in the month of January. I am happy with that number since myself, my wife and the girls have been battling the flu this month. I am confident I’ll be able to obtain my goals by the end of the year, and still have time to add in my new content and get that to the table as well as it comes in! A lot of my games will run me less than an hour to play, so I’ll play multiple games in a single night. Because I am always in need of new content on my social media I am forever switching up what I play, getting as much of my collection to the table as possible. That’s the nice thing about being a solo board gamer. I get to pick when and what I play without argument! Well, they aren’t pretty, but they work! 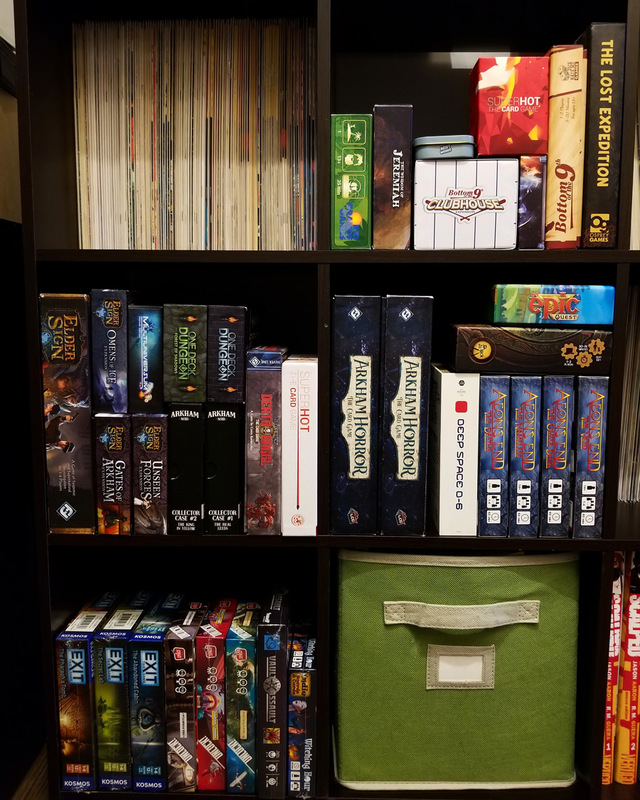 I opted not to use the traditional Kallax that you see so often in Board Game collection pictures. This is mostly because I like what I have and find it works well for what I’ve got. Mind you Kingdom Death Monster and Gloomhaven have received their own shelfs, but for everything else I don’t mind the plastic stacking shelf from Home Depot! My smaller games (and my comic collection, most of which isn’t shown) are in two Martha Stewart shelves that I also picked up from Home Depot. Each of those shelves have 9 cubbies for games and comics, and have treated me and my collection well over the past 2 years! PS: The bend in the shelves isn’t from my gaming collection. I’ve had those shelves for years and they used to be used to store all my tools and paint cans! Oh man. This is easily the hardest question for me to answer. There are SO MANY amazing games out there right now, and many of those games are in my collection. I’ll be honest, because of my love for horror and fantasy, Kingdom Death: Monster was my grail game. I missed the first Kickstarter campaign for it since I wasn’t even into gaming yet, but I spent a year and a half trying to get an affordable copy of it. When the second campaign launched for Kingdom Death: Monster 1.5 in November of 2016 I grabbed a copy for the Black Friday Sale amount. I’ve never been happier in my life. When the game shipped and it came to my house it changed the way I looked at gaming. On the flip side, Gloomhaven has also done that for me in the fantasy category. 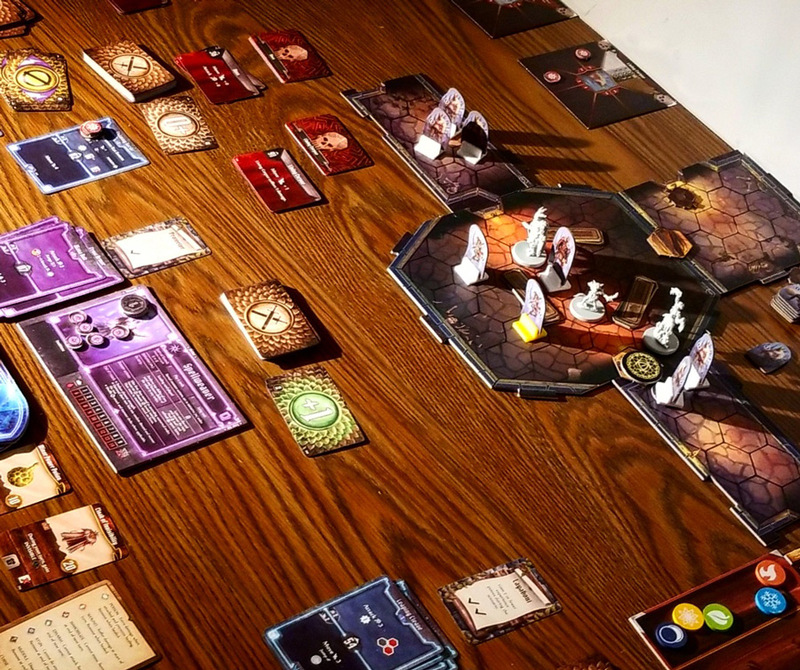 There is a reason Gloomhaven is #1 on Boardgamegeek.com and it’s arguably the best game ever. But I find these games, and other games like Spirit Island (do yourself a favour and check this game out!! ), Lord of the Rings: The Card Game, Arkham Horror: The Card Game, Too Many Bones, Legacy of Dragonholt, and classics like Pandemic Legacy are all so good that they’re almost like Olympians in the sense that they’re all so good at what they are, that it’s just whoever’s day it is in that moment that determines who’s the best. 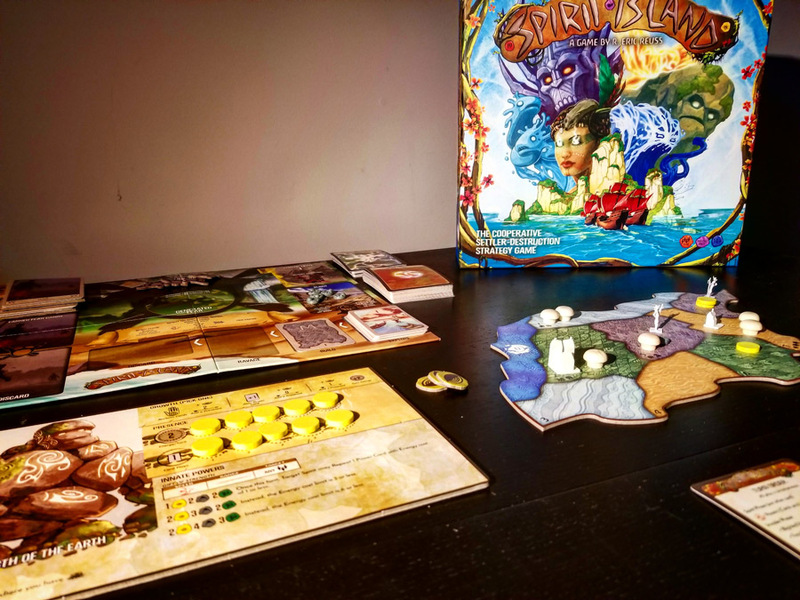 So FOR TODAY my favorite game is Spirit Island! It’s got a unique theme, it’s easy to set up and easy to learn/teach and it requires a lot of brain burning decisions, player powers and there are no dice which of course leaves no one to blame but yourself when you lose. I love that right now, so that’s why Spirit Island gets my nod for favorite game. Well like I mentioned above, Kingdom Death Monster is probably my most special. It was the only game I wanted for close to a year and a half. I have it now and that in itself was amazing for me. The fact that I love the game and everything about it just adds to it’s experience. But most obscure? For that I’ll 100% lean towards Triplock. The components are absolutely top notch and the mechanics are very unique. I don’t own and have never played anything else like it. I backed it on kickstarted and own all the game play content for it and absolutely love it. If you don’t own a game from Chip Theory Games yet you might not understand how special these games are. 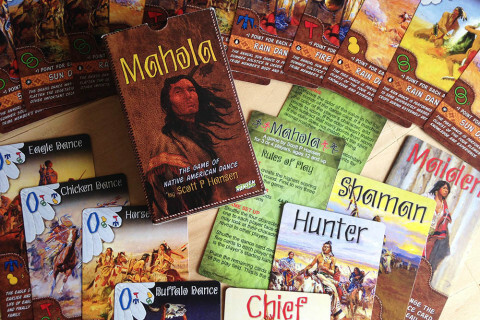 The quality of the components are top of the line and the game play/story telling in all of their games are second to none. 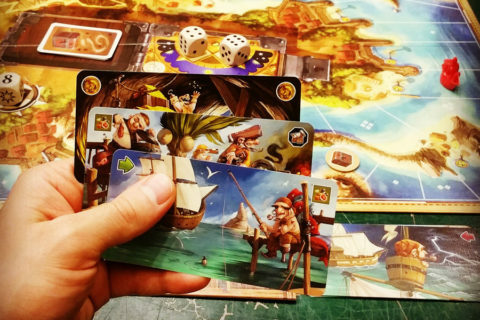 Solo board gaming is quickly becoming more and more popular. There are many Facebook pages, groups and website dedicated to them and it’s my biggest draw when it comes to deciding to back a game on Kickstarter or not. 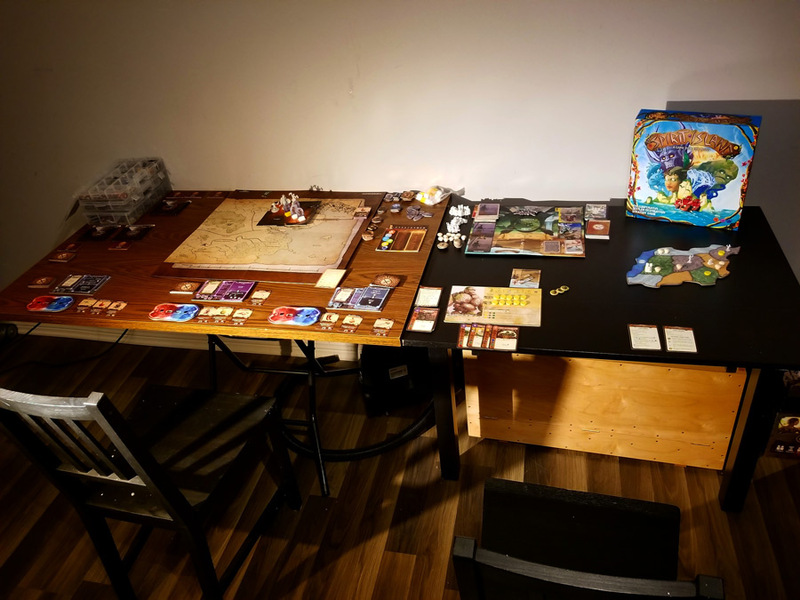 Having solo options are a great way to keep you in gaming even when you can’t make game night, or everyone else bails. Solo gaming allows me to adapt to my passion and play games even when my schedule might not always make it easy to do so. If you haven’t tried it out yet, please give it a shot. You can follow me on Instagram @Can_solo_gaming and please join the Solo Board Gamers group on Facebook where there are currently 12,000+ members! Cheers and thank you for visiting AnalogGames.com and for reading my story! Now get back to playing more games! Photo credits: @Can_solo_gaming / Used with permission. Love Gloomhaven. We’re playing our fourth adventure tonight – love it! So so digging solo gaming!